So far, I have shamefully neglected writing in depth about any of my travels, which collectively form a big part of my life here. This post is intended to start rectifying this oversight, and in doing so it makes sense to go back to the beginning – my very first trip out of Tehran, which also happens to remain one of my favourites. In November last year, two of my classmates had suggested going to a small village called Garmeh in Dasht-e Kavir, or the ‘Great Salt Desert’, just north of central Iran. Having yet to venture out of the capital, I jumped on the idea and we started planning for the upcoming long weekend. Our travel group consisted of my two classmates, their roommate in the dormitories and myself. Being four girls from Australia, Turkey, Afghanistan and Saudi Arabia, many of those we would come across in this and all subsequent travels together would look perplexed, asking how on earth we found each other. The sense of mystery etched on their faces would always disappear somewhat as soon as we responded that we just study together, nonetheless their happiness and excitement to meet us would remain. After a lengthy bus ride and a couple of taxis, we had finally descended upon Garmeh. We were received by the very friendly owner of the charming guest-house we had booked a room in, who was responsible for almost single-handedly reviving his ancestral village through restoring its mud-brick buildings, opening his guest-house and hostel and providing vital infrastructure to the area and employment for locals. Maziar, a grand figure with a distinct Gandalf-like resemblance, was a very kind host with a vibrant personality. Although his establishment, named Ateshooni, receives countless visitors and is constantly at peak capacity – especially after being featured in the popular traveller’s guidebook Lonely Planet – he was incredibly attentive and helpful. Over the next couple of days, he would drive us to surrounding villages, showing off his sand-duning skills while his preferred electronic tunes played on the stereo system. The guesthouse and rooms themselves were enchanting in their decor; the whole atmosphere gave the feeling of staying in a land lost in time. In the communal area of the guesthouse, located in a restored castle about five minutes walk from our room, delicious home-cooked food was served daily. The utter tastiness of every meal led me to take advantage of the cosy divan area to rest after over-stuffing myself every time (and not regretting it once). In this divan, Maziar would later treat us and his other guests to his musical performance on the didgeridoo, a traditional wind instrument developed by Australian Aborigines, which he had mastered. I had never heard of the instrument before, and the irony of hearing it played for the first time in a remote desert village in Iran was not lost on us. My friends and I were having a wonderful time wandering around the village, strolling through its far-reaching date palms and finding our way up a small mountain with a mesmerising water cave at its base. 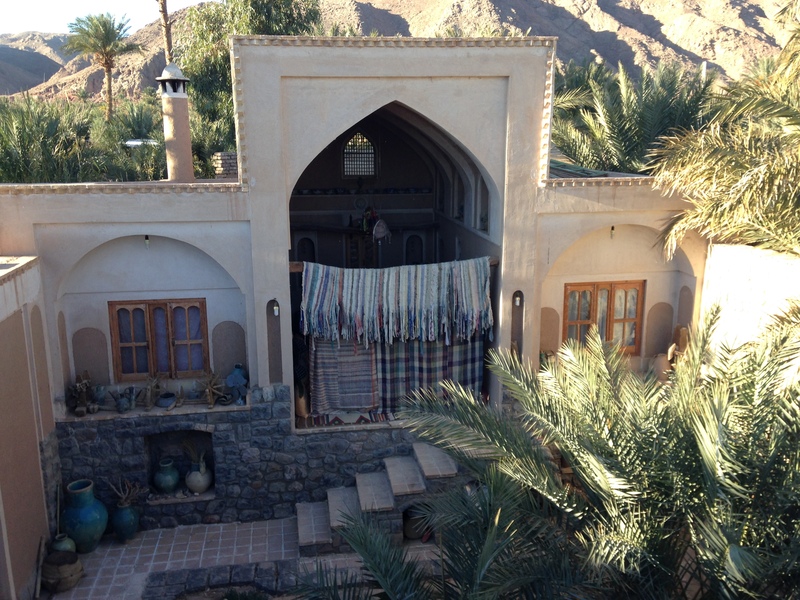 The photo on the homepage of my blog is actually taken from within one of the village’s historic, un-renovated mud-brick buildings overlooking the palm trees and mountains at the rear. At one point we relaxed up on the roof of the guesthouse, where we had a brilliant view of the entire village, reading our books and eating pumpkin seeds. We also visited the famous salt lake just outside of Garmeh, taking it upon ourselves to personally sample many of the crystallised hexagons of salt. On one of the nights, my friends suggested staying up to watch the moonrise, as it was a full moon and we were guaranteed a pristine view being in the middle of the desert. We took a rug, music speakers and some reinforcements (in the form of food and drink) out to the furthest spot we could find while still keeping the village lights in distant view. I had never watched a moonrise before, and the sight of it emerging as if from within the depths of the desert itself was absolutely breath-taking. We spent the rest of the night snacking and dancing against the backdrop of the silent, endless sands now flooded with moonlight. It is one of the best nights I’ve had in Iran so far. 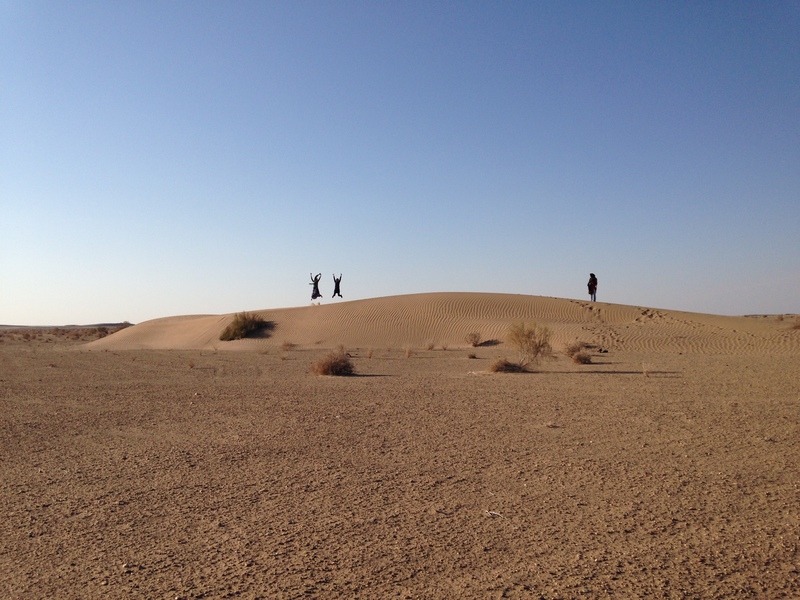 The next day, Maziar had organised a day trip for us as well as some of the other hostel guests to a spot in the middle of the barren desert. After some epic sand-duning on the part of Maziar, we parked the cars and got out to the view of a vast, bronze-coloured ocean of sand, extending as far as the eye could see. Although I would probably classify myself as mostly a ‘beach person’, there is something about the desert that has always profoundly moved me. Perhaps this stems from the fact that some of my not-too-distant ancestors were bona fide Bedouins. Whatever it may be, being there in the solitary, noiseless Dasht-e Kavir gave me an immense feeling of peace. 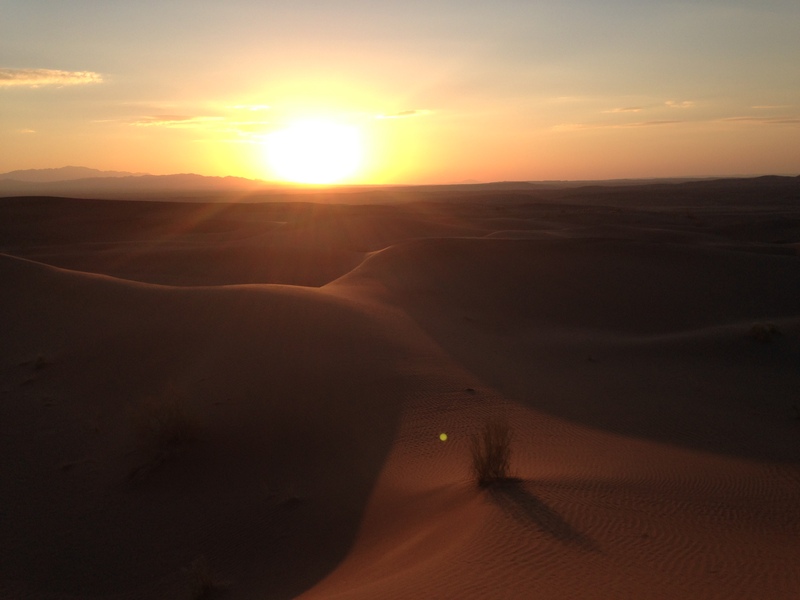 It didn’t stay noiseless for too long, however; my friends and I wasted no time in kicking off our shoes, climbing and running around the sand hills and dunes, and contemplating rolling down them as well – which we luckily reconsidered. We watched the sunset from one of these hills, complementing the moonrise we had seen the night before in a seamless and mystical way. As night began to fall, we were ushered over to a campfire, which we joyfully sat around as the air temperature was swiftly dropping. While we engaged in stilted conversation with our host and fellow guests (we were about a month into our Farsi studies at that point), we realised how hungry we were. Although we tried to ignore the pangs and appreciate the magnificent scene before us, I must admit I was thinking longingly back to my last, exquisite meal at the guesthouse. As the others conversed with each other and kept tending to the fire, we began to repeatedly hear the word sib-zamini, which is Farsi for potato (literally meaning apple of the earth). We weren’t sure whether we had become delirious from hunger or whether our Farsi was just that bad. Suddenly, like magic, Maziar began to unearth countless potatoes wrapped in foil that were baking under the embers of the fire. Our delight at seeing these was only matched by that which we felt after tasting the flavourful, piping hot potatoes. After we each had a few, my friends and I started to roast and devour everything we had on us. Apples, tangerines – nothing was safe from our makeshift skewers (basically just sticks). It was difficult to leave the peaceful and enthralling world of Garmeh. The only thing that consoled me on the bus ride back, with our early morning class at the back of my mind, was the promise of further travels to come. Speaking of, I post this piece while I am putting off packing (for me, the only downside to travel) for a trip to Yazd tonight, another desert city said to be an architectural and historical treasure. More soon.